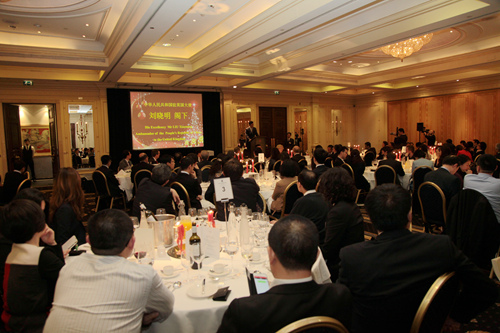 On 18 December 2014, Chinese Ambassador to the UK Liu Xiaoming attended and addressed the New Year Celebration Dinner of China Enterprises Association in Britain (CEAB). Present at the event were nearly 140 guests, including Lord Nathanael Ming-Yan Wei, Member of the House of Lords and Chairman of the All-Party Parliamentary Group for East Asia Business, Mr. Stephen Perry, Chairman of the 48 Group Club, Mr. Lise-Mette Bertelsen, Executive Director of China-Britain Business Council, Mr. Peter Bishop, Deputy President of the London Chamber of Commerce and Industry, Executive Director of Hong Kong Association and Society Robert Guy, representatives of Chinese enterprises in the UK, and business people of the UK. 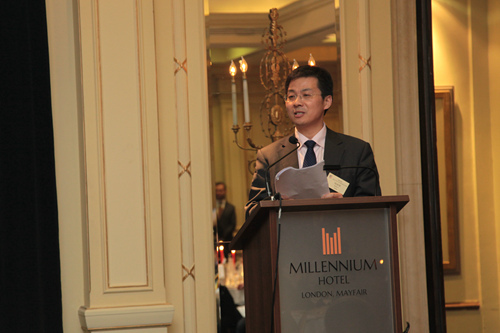 Ambassador Liu said in his speech: "The year 2014 has seen remarkable growth for Chinese enterprises in the UK. Your great efforts have turned in an excellent report card. You have realised some outstanding breakthroughs. Here are some of the highlights: Industrial and Commercial Bank of China set up a branch in London; China Construction Bank (London) Limited became the first clearing bank for renminbi outside Asia; Bank of China London Branch issued renminbi bonds and underwrote UK government renminbi bonds for the first time; Just this morning, Bank of China's Bulk Commodity Business Centre was established in the London Branch. Property companies such as ABP, Greenland and Wanda launched major projects in the UK successively. I want to express my very warmest congratulations and sincere appreciation to all the Chinese enterprises in the UK: I congratulate you on your outstanding achievements. And I thank you for your contribution to the economic cooperation between China and Britain. "The year 2014 has also seen CEAB reach ever higher with achievements. CEAB has staged one major event after another. "During the visit of the Chinese leaders, CEAB hosted a series of high-profile joint events in cooperation with UK business organizations. These included a business summit, an economic and trade forum and a business gala. "This gave a powerful boost to CEAB's image and influence. As a result, in 2014 CEAB continued to grow: You admitted nearly 40 new members. You organised over 20 field trips, workshops and lectures. And you built close cooperative relations with more than ten foreign chambers of commerce. All these developments are evidence of strong progress, broader outreach and greater authority for CEAB. I want to most warmly congratulate CEAB on your success. 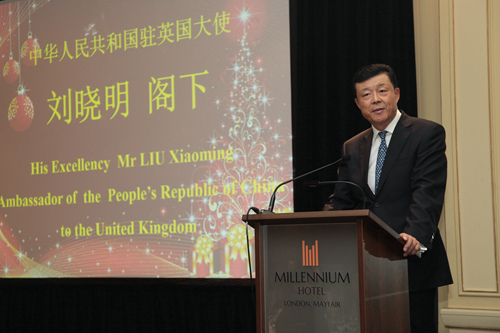 "The coming year 2015 will be of great significance for both China and the China-UK relationship. President Xi Jinping pointed out at the recent Central Foreign Affairs Conference: China must strengthen cooperation with the world and, through cooperation, promote win-win results. The Central Economic Conference convened this month emphasised the following: First, improve the efficiency and quality of outbound investments; second, encourage competitive industries to go global; third, engage in cooperation on cutting-edge technology; and fourth, steadily advance the internationalisation of renminbi. With these in mind, I foresee another golden year for Chinese enterprises in the UK. I hope that you will seize the new opportunities of China's comprehensive deepening of reform. And you will catch the new momentum of the China-UK relationship. Here in the UK, you have access to exceptional resources and advantages. I urge you to engage in joint R&D and innovation, deepen cooperation on infrastructure, introduce China's equipment and technology to local businesses, and accelerate financial cooperation. You are the ones who are in an optimal position to help take China-UK economic cooperation to a new level. "I want to assure CEAB and Chinese enterprises of the continued support from the Chinese Embassy. I am confident that, through our joint efforts, China-UK economic cooperation will surely continue to make remarkable progress." Mr. Si Bingjun, the new President of CEAB, said that the Association will continue playing its role as a bridge and platform for exchanges, communication and cooperation between enterprises, and make new contributions to expanding the trade and economic cooperation as well as the friendship between China and the UK. 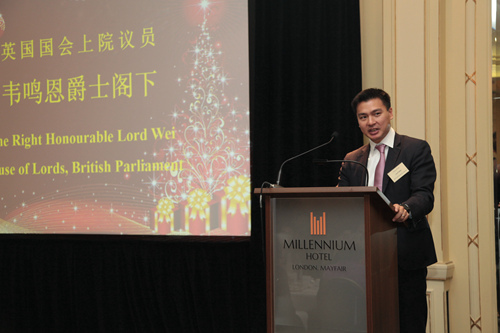 Lord Nathanael Ming-Yan Wei in his speech expressed his congratulations to CEAB on its achievements, and highly commended its role in the economic development in the UK. He also extended a welcome to all Chinese enterprises hoping to invest in the UK. CEAB is a non-profit organization established by the Chinese enterprises (institutions) in the UK in 2001, currently with nearly 160 members.